'Going Solar' is a great start to reducing your carbon footprint on this planet, as well as lowering or even eliminating your utility bills. With advances in technology, lowering cost of equipment, a 30% rebate from Uncle Sam, and state and local utility incentives, choosing to produce your own solar energy has never been so affordable. 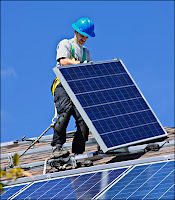 Many things factor in to the cost/benefits of adding solar to your home. But the bottom line is no matter where you live on this earth, producing your own solar energy more than pays for itself. Not to mention, you're helping to save the planet one small step at a time. Living in places like California, Texas, Florida and New York where the price per Kilowatt hour (KWh) can be $0.15 or more and rising, a solar addition pays for itself much quicker than places like Iowa (avg $0.10/KWh). That doesn't mean going solar in Iowa isn't a cost effective decision however. So lets do the math. The average solar system (complete system) averages about $2.50 per "capable" watt produced. For example, a 5000 watt solar system is "capable" of averaging 5000 watts of power in direct peak sunlight. For this example, let's say you purchase a 5 kilowatt system (that's 5,000 watts). Going by the national average of $2500 per KW, we'll assume this system will cost a total of $12,500 in equipment and an additional $5,000 for labor, permits, and certifications- bringing your total to $17,500. If you factor in the 30% rebate from uncle Sam, your cost has already been reduced to $12,250. Most states have a renewable energy incentive program to help reduce the costs even further, Iowa fortunately is one of them. They offer a 15% tax rebate up to $1500. In this example, you would qualify for maximum $1,500 in tax rebates. (15% of the original $17,500 is $2,650). Between Federal and State tax incentives alone, your solar system has now been reduced by $6,750 to a total of $10,750. The most recognized way to figure how much power a solar panel will produce is to multiply the hours of peak sunlight (hours when the sunlight is at its strongest point) times the number of KW your system can produce. According to the National Renewable Energy Laboratory (NREL), my annual average peak hours per day is 5.08. So 5000 watts X 5.08 peak hours is 25,400 Watt hours, or 25.4 KWh per day. That's a total average of about 9,270 KWh per year. Alliant Energy's incentive will pay you at least .75/KWh (Up to $1.50/KHw) for the total your systems annual capability which in this case would total $6,953. Now that your 5KW solar system has been reduced to a total cost of $3,797, how long would it take for the solar system to pay for itself? Lets figure it up! The average cost of a KWh from the Iowa utility companies is about $0.10, meaning your system could produce an average of about $695 worth of electricity per year. In this case, your entire system would have payed for itself in just under 5.5 years. Most solar companies guarantee their products for 25 years. So for the example I used above, that would mean about 19.5 years of free solar electricity. It is very important to note that these figures are based heavily on averages and your actual costs and energy will vary from these figures. Quite something. I like the idea that Solar electric power is a reasonable choice - something a homeowner can decide to do. Agreed. 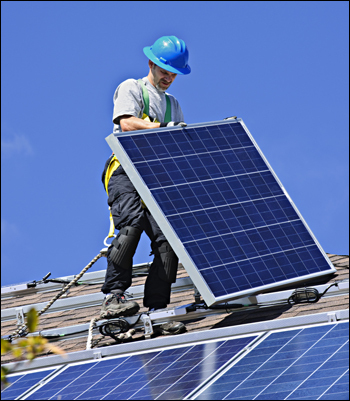 As prices come down, solar becomes easier and esier to afford for the average homeowner.